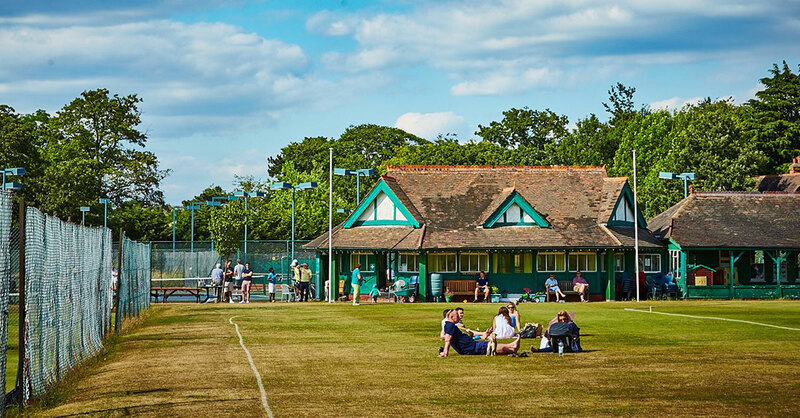 I have been a member of the Beckenham Cricket Club all my life, and I have had a lot of fun – and a few disappointments – so I felt I would like to write down what I can remember for my own amusement, and perhaps for the amusement of some of my friends. 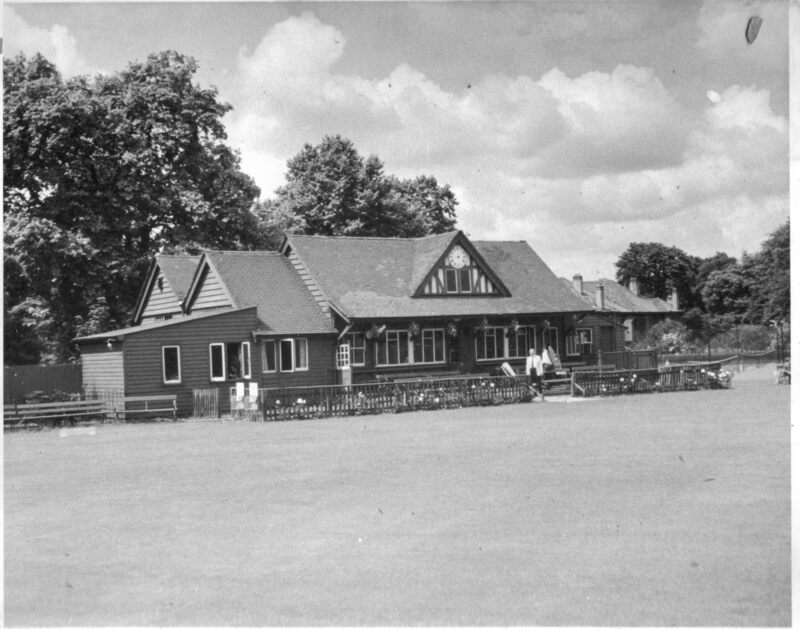 My earliest memory of the Beckenham Cricket Club, from about 1931, is of being taken there at weekends to have tea with my parents, having been well scrubbed and dressed in a clean frock, and with warnings to be on my best behaviour. We were served by Miss Tate, who was the daughter of the previous groundsman. She always wore a cloche hat pulled well down over her ears and forehead. Folding tables were set up in the veranda and covered with white cloths, and tea was brought on a tray – pots of tea, jugs of hot water and of milk, as well as dainty sandwiches and home made cakes. No one ever had to queue. 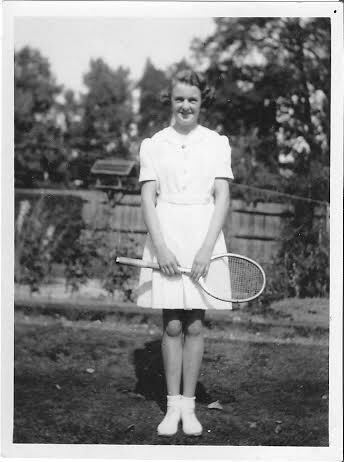 My parents were both county tennis players and in the club’s first teams, so I was encouraged to play from a very young age. There were hardly any junior members, only a very few children of senior members, and these were only allowed to play if they were supervised by their parents or other responsible adults. In fact, children were definitely expected to be seen and not heard. There was, of course, no club coach and we only learnt if our parents were interested enough to teach us. I was one of the lucky ones, and at the age of six I joined as a junior member. I believe the subscription was half a crown, (121 pence) a year. What is now known as the old or tennis pavilion was then the Ladies’ Pavilion. No females were allowed in the main pavilion, not even in the enclosure in front of it, so any activities in which I was involved happened at that end of the ground. I remember very little about the cricket pavilion before the war, as I was not allowed anywhere near it – nor was my Mother! The end of the Ladies’ Pavilion, which is now the tennis lounge had no front wall or windows then, so was open to the elements and very draughty. It was referred to as the ‘Ball Room’ because on the back wall there were hooks, the same number as there were tennis courts, and on these hung string bags of tennis balls provided by the club. New ones were issued at regular intervals but in between used ones were cleaned in a machine containing revolving brushes with a handle to turn them. My mother was in charge of all this, and I sometimes accompanied her to the club when she ‘did the balls’ and was allowed to turn the handle and put the balls back in their string bags. 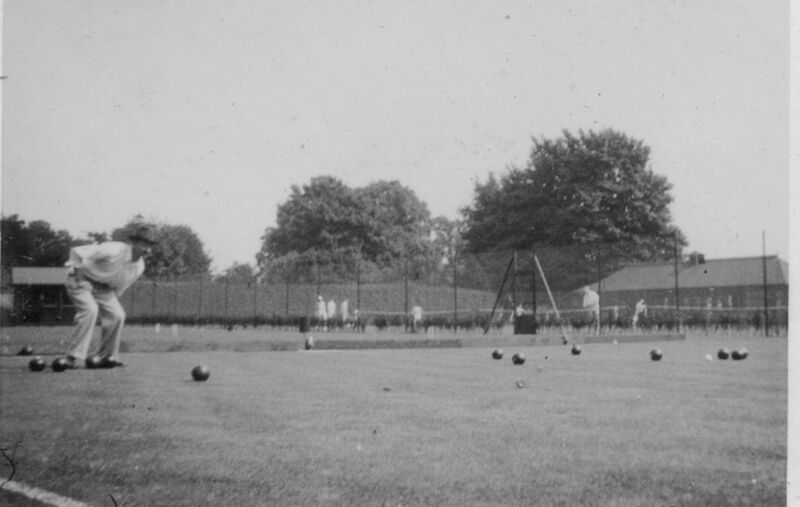 Behind the acrylic courts, on what are now courts 5, 6 and 7 [since 2011, artificial clay courts], there was a croquet lawn and a bowling green. These were beautifully kept, and I think they must have been used mainly by the older members. I remember them as being very green and very quiet, and children such as myself were not encouraged to venture too near. By 1936, the two outside squash courts had been built, and I can remember how pleased my parents were at the prospect of being able to play so near to home as, up till that time, they had been forced to join London clubs. Squash had not become popular by then, and comparatively few people were interested in playing it, so local courts were very scarce. Now that there were some almost at the end of our garden (we lived in Foxgrove Avenue) my brother and I were encouraged to start playing. I was about ten and could manage a light racket, but my brother was only seven and used one of my mother’s with the handle cut short and bound with plaster to make a grip. In those days rackets were made of laminated wood and were much heavier than modern ones. In the last two or three years before the war started, I mainly remember the summer weekends, watching cricket, which I loved, and learning to play tennis with my parents and the very few junior members. I am sure we had wet weekends and the sun didn’t always shine, but it seems as if it did. Beckenham Cricket Club was comparatively fortunate, as many clubs and other open spaces were requisitioned for anti-aircraft and balloon barrage emplacements. Our ground was halfway between the sites in Beckenham Place Park and Cator Park, so we were allowed to keep the Club going for recreational purposes. The squash courts, were our only casualty at that stage, when the central gallery was taken down and the building turned into a rifle range to train the Local Defence Volunteers (later the Home Guard). However, cricket and tennis continued and we were lucky that our groundsman, Carter, was too old to be called up, and his two helpers, the Humble brothers, were too young though they, of course, joined the armed forces later. As several local clubs had been forced to close because their grounds had been requisitioned, some of their members joined Beckenham. Most notable among these were Sir Gerald and Lady Slade and the Hammer family from Sydenham Tennis Club. Sir Gerald and Eric Hammer subsequently became Presidents of our club. Everything possible was done to keep cricket and tennis going after the war started. Older members helped with administration and running the bar (when there was anything with which to stock it) and the younger ones arranged matches and helped prepare the ground so that the cricket square and tennis courts were fit to play on. It was a point of pride to have at least one cricket match each weekend so that any serviceman returning on leave would be able to get a game. The home team was made up of anyone who could be persuaded into cricket flannels – the Humble boys, until they were called up, schoolboys, sometimes no more than thirteen years of age, the old who were past it and the infirm, including my father who was crippled with arthritis. Should any returning servicemen want to play the requisite number would drop out of the team – sometimes with mutters of thankfulness on their lips! I remember so well on the Saturday after the evacuation from Dunkirk, several members who, only a couple of days before, had escaped the hell of the beaches, were serenely playing cricket. During the Battle of Britain, it was not uncommon to see dog-fights in the sky above the ground while down below people continued to play their tennis and cricket. Once the bombing started in earnest most young members were evacuated to safety or in the forces. Those older ones who stayed kept the club going, most particularly Bert Curwen, who practically lived there to make sure everything possible was done to keep the club safe. He helped to keep the ground clear of shrapnel, and remove the incendiary bombs which made holes in the turf and threatened to set fire to the pavilions. Bert also did his very best to obtain stocks for the bar so that he could run a modest establishment for those playing sport at the weekends. Joe Harms, who was in a reserved occupation and a member of the Home Guard, did sterling work on the ground, getting up parties to mow and weed, and himself marking out courts and cricket pitches at the weekends. All mowing, of course, had to be done with hand mowers as petrol was strictly rationed. I can remember being in one of Joe’s weeding parties, when all volunteers arrived at the Club armed with a kitchen fork and something to kneel on. We formed a line across the ground and removed every weed. Depending on how many members turned up, and consequently how wide the line was, we then went up and down the ground several times until the job was done. The club sustained a few direct hits, although luckily the buildings were only damaged by blast and, thanks to Bert Curwen’s vigilance, incendiaries did not do too much damage. One high explosive bomb fell right in the middle of the hard courts (now macadam courts 8, 9 and 10) which put them out of action for the rest of the war, until they were repaired by War Damage in the late forties. The biggest missile to fall on the club was a landmine. These were designed to come down on parachutes and explode so that the blast fanned out all round and did an enormous amount of damage. This one became detached from its parachute and exploded on impact; the result was a large and very deep hole just where grass courts 11, 12, 13 and 14 meet. When my brother and I came home during a lull in the bombing raids, we were able to feed the ducks which were happily swimming around on the water which had collected in the crater. It was lucky that this did happen as, if the mine had exploded as it was meant to, both pavilions would have been destroyed as well as a lot of the surrounding houses. The damage to the courts took a long time to recover, in fact it is only comparatively recently that the base lines on courts 11 and 12 have stopped sinking. Some members may remember how there was a noticeable dip in that area, in spite of frequent attempts to fill it in. Once the Luftwaffe raids had stopped, my brother and I were allowed to return home for the school holidays, so we were there when the V1 and V2 missile attacks began. Cricket and tennis continued at the club and it was quite usual to see the doodle bugs pop-popping overhead during a game, and we would pray that the engine would keep going and not cut out above our ground. By this time I had left school and was living permanently at home. My mother and I had discovered that we could play squash at the Midland Bank ground near New Beckenham train station. Our own courts were still without a central gallery, and were not renovated until some time after the war ended. We were rather upset when a V2 rocket landed on the Midland Bank courts, and so playing squash was once again denied us. Once the war was over things gradually got back to normal. War Damage helped to pay for repairs to the hard courts and squash courts, although it was quite a while before it was done. Obviously repairs to people’s homes had to come first. The international tournament resumed, and that became a really enjoyable occasion for Beckenham residents. It was long before professional tennis and commercialism had taken over, and club members, both from Beckenham and other local clubs, were able to take part. There were two classes of singles for men and women (although in those days they were referred to as gentlemen and ladies), the Kent All-Comers’ for the 32 best players who had entered, and the Beckenham Championships for all the rest. The doubles were not divided like this, so that ordinary club players could easily find themselves playing against the stars, which was rather frightening but, in retrospect, great fun. Club tournaments started again and social events were organised – particularly dances held in the Ladies’ Pavilion. The veranda was boarded in during the winter and turned into a bar and sitting area, and we had some good parties there. Ladies were still not allowed in the main pavilion. Before the present pavilion and inside squash courts were built, there was a flag staff next to the hard courts, under which there were some seats, and that is where we had to take our refreshments. In fact, we could not even get a drink unless we could prevail upon some man to buy us one! Eventually, of course, it had to change, but even then, in the late fifties, there were some old die-hards who thought it was a very retrograde step. 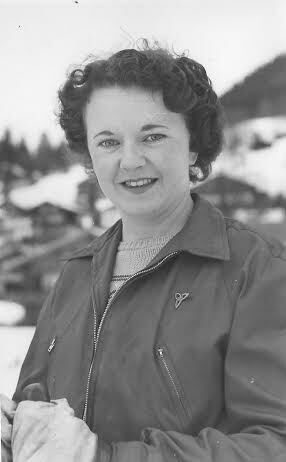 Tonie Thomas was a former Beckenham Lawn Tennis Club Chairman & Beckenham Cricket Club Vice President.